Q #1. What does the Drug of Abuse Urine Test do? A. 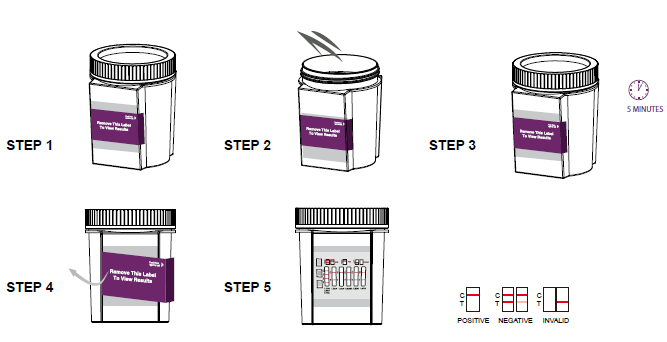 These tests indicate if one or more prescription or illegal drugs are present in urine. The testing is done in two steps. First, you do a quick at-home test. Second, if the test suggests that drugs may be present, you send the sample to a laboratory for additional testing. Q #2. What is “cut-off level”? A. The cut-off level is the specified concentration of a drug in a urine sample. Above that concentration the test is called positive, and below that concentration it is called negative. Q #3. What are drugs of abuse? A. Drugs of abuse are illegal or prescription medicines (for example, Oxycodone or Valium) that are taken for a non-medical purpose, including taking the medication for longer than your doctor prescribed it for or for a purpose other than what the doctor prescribed it for. Q #4. How accurate is the test? A. The tests are sensitive to the presence of drugs in urine sample. These tests are not as accurate as lab tests. In some cases, certain foods and drugs may cause false positives as well as false negatives for those who use drug-testing kits. Q #5. Does a preliminary positive screen test mean that you have found of abuse? A. This means that the test has reacted with something in the sample and the sample must be sent to the lab for a more accurate test.